"James J. Braddock is an Irish-American boxer from New Jersey, formerly a light heavyweight contender, who is forced to give up boxing after breaking his hand in the ring. This is both a relief and a burden to his wife, Mae. She cannot bring herself to watch the violence of his chosen profession, yet she knows they will have no good income without his boxing. With a shot at the heavyweight championship held by Max Baer a possibility, Braddock continues to win. Out of a sense of pride, he uses a portion of his prize money to pay back money to the government given to him while unemployed. 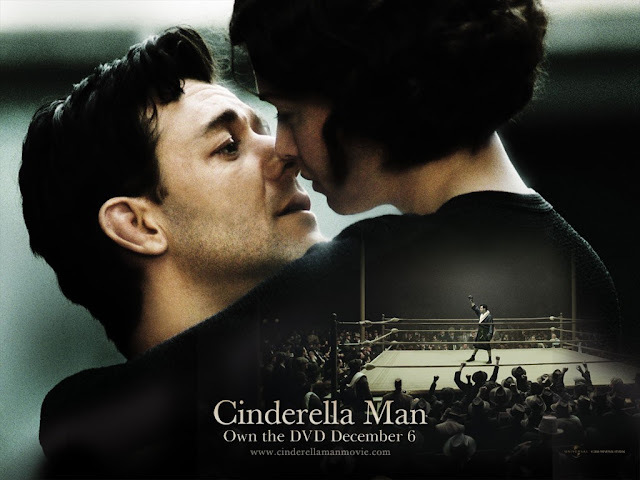 When his rags to riches story gets out, the sportswriter Damon Runyon dubs him ""The Cinderella Man"", and before long Braddock comes to represent the hopes and aspirations of the American public struggling with the Depression. An epilogue reveals that Braddock later worked on the building of the Verrazano Bridge, owning and operating heavy machinery on the docks where he worked during the Depression, and that he and Mae used his boxing income to buy a house, where they spent the rest of their lives."